TM editors' note: This article discusses a penny stock and/or microcap. Such stocks are easily manipulated; do your own careful due diligence. GS Retail Company Limited is a Korea-based company founded in 1971. It engages mainly in franchise chain convenience stores, including GS25 which accounted for 76% of 2017 revenue. GSR also engages in other businesses of supermarket, hotel, advertising, and health and beauty retail. GSR’s GS25 convenience stores (CVS) are the core revenue contributor at 76%. 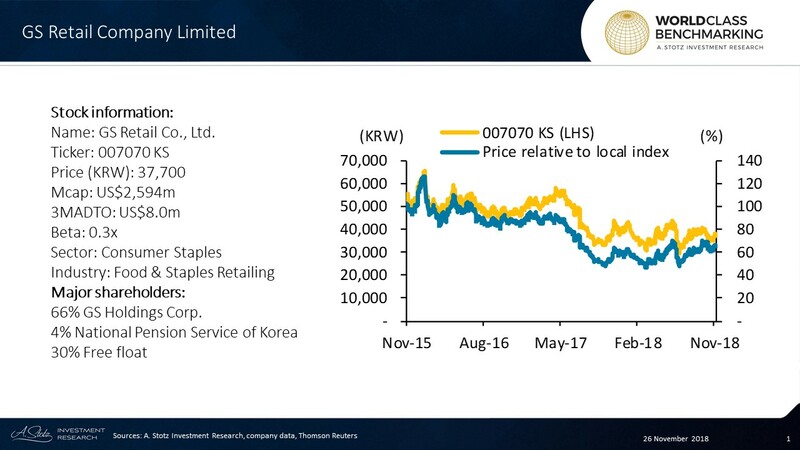 The company expanded its store count by 6% in 3Q18 YoY and now has about 13,000 stores across Korea. 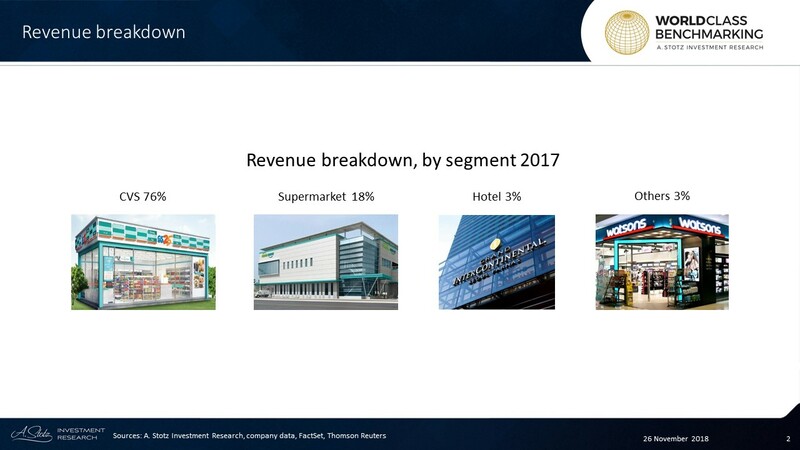 The company also operates a larger store format, GS supermarket, which contributes 18% of its revenue and has more than 300 across Korea. In the hotel business GSR has brands of Parnas Hotel and InterContinental Hotel which contributed 3% of revenue. The remaining revenue comes from other businesses such as health and beauty retail, advertising, and transport agency. GSR has been actively implementing various cost-control measures, restructuring programs, and integrated procurement for its supermarkets and CVS to improve margins. Under the integrated procurement, its supermarkets and CVS act as a single buyer for the same items to allow for lower prices and better terms. 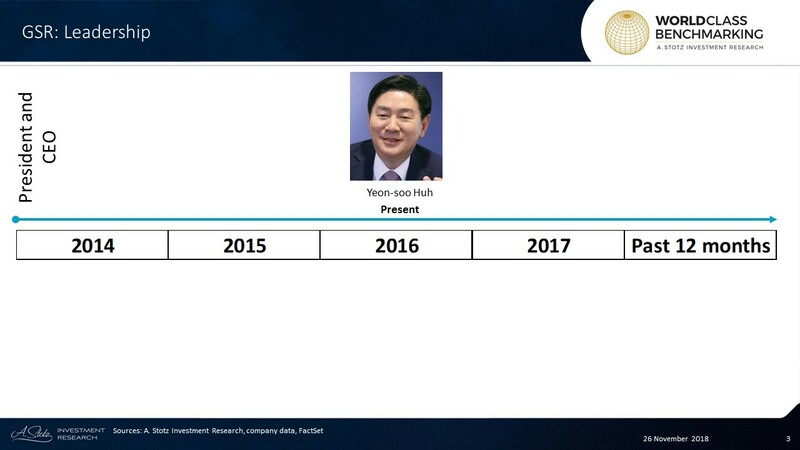 Yeon-soo Huh is the current President and CEO of GSR. He is also on the Board of Directors at GS Holdings and other companies within the group, including GS Netvision, GS Home Shopping, and Parnas Hotel. He received his Bachelor’s degree from Korea University and Master’s degree from Syracuse University, US. Profitable Growth has fallen from an already unimpressive rank of #6 in 2014 to be among the worst in the past 12 months. Profitability rankings have followed the ones of Profitable Growth almost exactly with marginally better performance in the past 12 months. Growth has shown excellent results in 2015 and 2016 but has fallen drastically since. Disclaimer: This content is for information purposes only. It is not intended to be investment advice. Readers should not consider statements made by the author(s) as formal recommendations and should consult their financial advisor before making any investment decisions. While the information provided is believed to be accurate, it may include errors or inaccuracies. The author(s) cannot be held liable for any actions taken as a result of reading this article. Andrew Stotz, PhD, CFA is the CEO of A. Stotz Investment Research, a company that provides institutional and high net worth investors with ready-to-invest stock portfolios that aim to beat the benchmark through superior stock selection. While previously as Head of Research at CLSA, Andrew was voted No. 1 Analyst in Thailand in the Asiamoney Brokers’ Poll for two years in a row. He was also voted No. 1 Analyst in Thailand in the Institutional Investor magazine All-Asia Research Team Report. Andrew has been a lecturer in finance for 25 years at various universities in Thailand and is currently a research faculty and a member of the international advisory board at Thammasat Business School and an adjunct professor at the University of Science and Technology of China. He served two terms as president of the CFA Society of Thailand.